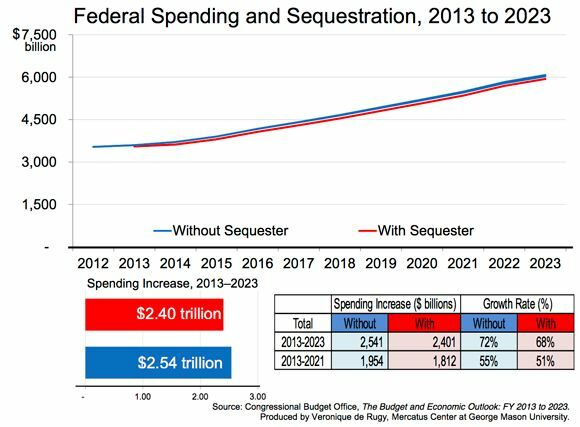 Veronique de Rugy of the Mercatus Center at George Mason University prepared the graphic above to allow us to see the catastrophe that Obama is warning us about due to the sequester he requested and refuses to prevent. Now he is playing Chicken Little and telling us the sky is falling due to the decreased growth in federal spending from 2013 to 2021 from 55% growth to 51% growth. Or a decrease in super-high growth to 2023 of 72% to super-high growth of 68% is sure to be our doom. Look, our doom is due the failure of the government to make the drastic cuts needed to bring spending down to the levels of tax income. Our doom is due to having a government that has grown over the last 80 years to the point it is spending four times as much as it is constitutionally empowered to do while exercising powers appropriate for absolute monarchs and dictators. We are in this financial fix because more fundamentally we have allowed government to become the chief violator of our sovereign individual rights to life, liberty, property, the ownership of our own bodies, minds, and labor, and to choose our values for us rather than to allow us to pursue our own happiness. It is very expensive to give up the management of your life to government. This lesson is perhaps the most repeated and obvious lesson of history.